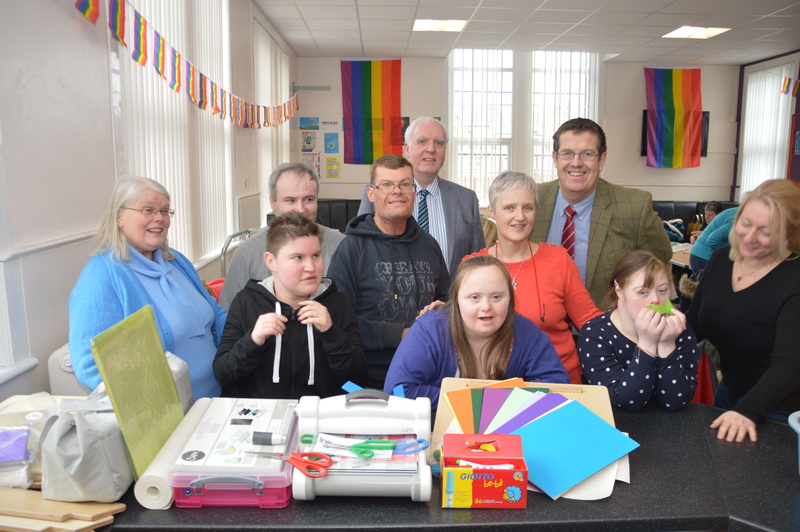 A unique West Lothian craft group is now able to look to the future – and continue offering classes that enrich the lives of disabled adults and their carers, thanks to a timely and sizeable donation. The Bee Happy Craft Group, which hosts classes at West Calder Community Centre, has been boosted by a £2,500 grant from the Community Fund set up by Banks Mining to support community and environmental projects around the Rusha surface coal mine. The classes hosted by the group offer members with a range of disabilities the opportunity to express their creativity while providing a source of valuable respite and social time for carers. The grant has helped the group to purchase essential craft materials, such as cards, supplies and beads for jewellery and the group has also been able to purchase an iPad controlled die cutting machine, which will help participants to create more complex projects and support the future activity of the club. Volunteers at the craft group are delighted with the backing, which is so important for its members, who come from across the region to attend the popular classes. Jill Stewart, said: “What started with a group of parents with grown-up disabled children, looking to get together to create a fun activity, has grown into an essential service for all involved – who come along wind rain or shine. “Bee Happy provides members with life-long learning by introducing them to wide and varied craft classes which will enhance skills they already have and learn new ones. “The equipment bought through the grant has already shown us that all our members do have hidden skills and are able to participate better than before. For instance with the dye cutter, members can now choose a picture, paper and then select the appropriate actions. Little things like this are big challenges to some and when they are able to show a new skill, it can help their support worker to help them progress in other areas. Bee Happy, which is the only group of its type in West Lothian, receives its referrals from organisations such as Enable, The Action Group, parents of the disabled and the local social service team. Due to the nature of the disabilities, all the group’s 14 members attend with carers, who join in with the activities. Greg McCarra, Local Ward Councillor and Liaison Committee Chair, said: “The Bee Happy Craft Group is a very positive local group run by dedicated and inspiring individuals. “The grant money is going to great use, ensuring the group’s many users have the necessary tools and supplies to help create imaginative craft-work. Mark Dowdall, environment and community director at the Banks Group said: “What the Bee Happy Craft Group does for so many members of the local community is truly inspiring and it is a pleasure to see our community fund support this marvelous operation. Banks has permission to undertake operations at the Rusha surface mine, to the west of West Calder, for a seven-year period. Once coal extraction is complete the 154-hectare site will be fully restored and landscaped to a mixture of woodland and agriculture. The company estimates that the Rusha site will contribute more than £5 million to the local economy every year through wages and other supply chain contributions. In addition to the 44 people employed on site, it will also support a number of other off-site jobs in related transport and supplies activity.